Medford is a city in, and county seat of, Jackson County, Oregon, United States. 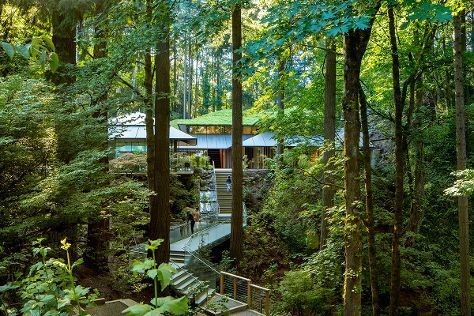 Start off your visit on the 1st (Thu): stroll through Lithia Park, then see a show at Oregon Shakespeare Festival, and then explore the activities along Rogue River. For maps, other places to visit, reviews, and tourist information, read Medford trip itinerary maker tool . Los Angeles to Medford is an approximately 4.5-hour flight. You can also drive. Expect a bit warmer weather when traveling from Los Angeles in August: highs in Medford hover around 93°F, while lows dip to 60°F. Wrap up your sightseeing on the 2nd (Fri) to allow time to drive to Crater Lake National Park. Kick off your visit on the 2nd (Fri): explore the wealth of natural beauty at Crater Lake National Park. Get ready for a full day of sightseeing on the 3rd (Sat): hike along Cleetwood Cove Trail, take in the dramatic scenery at Whitehorse Falls, and then take in the dramatic scenery at National Creek Falls. For ratings, photos, maps, and tourist information, refer to the Crater Lake National Park tour itinerary planner. Getting from Medford to Crater Lake National Park by car takes about 2 hours. In August in Crater Lake National Park, expect temperatures between 93°F during the day and 60°F at night. Cap off your sightseeing on the 4th (Sun) early enough to go by car to Bend. Start off your visit on the 4th (Sun): wander the streets of City of Sisters, then immerse yourself in nature at Smith Rock State Park, and then get interesting insight from Tours. To find photos, maps, and tourist information, read our Bend trip planner . Drive from Crater Lake National Park to Bend in 3 hours. Alternatively, you can do a combination of taxi and bus. Traveling from Crater Lake National Park in August, expect Bend to be slightly colder, temps between 84°F and 52°F. On the 5th (Mon), wrap the sightseeing up by early afternoon so you can take a bus to Eugene. Eugene is a city of the Pacific Northwest located in the U.S. On the 5th (Mon), explore and take pictures at University of Oregon. Before you visit Eugene, use our trip planner to discover what you can do and see there. Getting from Bend to Eugene by bus takes about 2.5 hours. Other options: drive. August in Eugene sees daily highs of 86°F and lows of 54°F at night. Wrap up your sightseeing by early afternoon on the 6th (Tue) to allow time for the bus ride to Florence. Florence is a coastal city in Lane County, in the U.S. On the 6th (Tue), kick back and relax at Heceta Beach. To find ratings, reviews, where to stay, and other tourist information, read Florence day trip website . You can take a bus from Eugene to Florence in 1.5 hours. Alternatively, you can drive. While traveling from Eugene, expect little chillier days and about the same nights in Florence, ranging from highs of 68°F to lows of 54°F. Finish your sightseeing early on the 8th (Thu) to allow enough time to take a bus to Eugene. Start off your visit on the 8th (Thu): stroll through Willamette River bike trail and then hike along McKenzie River National Recreation Trail. To see photos, more things to do, where to stay, and more tourist information, refer to the Eugene trip itinerary app . Getting from Florence to Eugene by bus takes about 1.5 hours. Other options: drive. While traveling from Florence, expect somewhat warmer days and about the same nights in Eugene, ranging from highs of 86°F to lows of 54°F. Wrap up your sightseeing on the 9th (Fri) early enough to drive to Portland. Step off the beaten path and head to Wine Tours & Tastings and Pittock Mansion. Change things up with these side-trips from Portland: Mount Hood (in Hood River) and Multnomah Falls (in Bridal Veil). There's still lots to do: admire the natural beauty at Lan Su Chinese Garden, look for all kinds of wild species at Columbia River Gorge National Scenic Area, look for gifts at Powell's City of Books, and get outside with Portland Timbers. Plan my trip to Portland with suggested itineraries provided by Inspirock. Traveling by car from Eugene to Portland takes 2 hours. Alternatively, you can take a bus; or fly. Traveling from Eugene in August, plan for somewhat warmer nights in Portland, with lows around 60°F. Wrap up your sightseeing by early afternoon on the 13th (Tue) to allow time for the car ride to Olympia. Olympia is the capital of the U.S. Kick off your visit on the 13th (Tue): see the interesting displays at The Chehalis Centralia Railroad & Museum. Get ready for a full day of sightseeing on the next day: have fun and explore at Hands On Children's Museum, look for all kinds of wild species at Nisqually Reach Nature Center, then get outside with Mystic Journeys, and finally view the masterpieces at Childhood's End Gallery. To see more things to do, maps, ratings, and other tourist information, read our Olympia trip itinerary builder app . Traveling by car from Portland to Olympia takes 2 hours. Alternatively, you can take a bus; or take a train. Expect slightly colder evenings in Olympia when traveling from Portland in August, with lows around 52°F. Finish your sightseeing early on the 16th (Fri) to allow enough time to take a bus to Olympic National Park. Eschew the tourist crowds and head to Hurricane Ridge and Olympic National Park. The adventure continues: enjoy the sand and surf at Ruby Beach, trek along Ozette Loop Hike, explore the activities along Crescent Lake, and take a peaceful walk through Hoh Rain Forest Visitor Center. For other places to visit, reviews, ratings, and other tourist information, go to the Olympic National Park day trip planning app . Take a bus from Olympia to Olympic National Park in 2.5 hours. When traveling from Olympia in August, plan for slightly colder days and about the same nights in Olympic National Park: temperatures range from 72°F by day to 53°F at night. Cap off your sightseeing on the 19th (Mon) early enough to travel to Seattle. On the 20th (Tue), admire the striking features of Seattle Public Library, enjoy breathtaking views from Space Needle, admire the masterpieces at Chihuly Garden and Glass, then tour the pleasant surroundings at Kerry Park, and finally take a leisurely stroll along Hiram M. Chittenden Locks. Here are some ideas for day two: don't miss a visit to Columbia Center, then admire the striking features of Sky View Observatory, then let your taste buds guide you at a local gastronomic tour, and finally take a stroll through Pike Place Market. To find maps, reviews, more things to do, and other tourist information, use the Seattle online trip itinerary builder . Traveling by combination of bus and ferry from Olympic National Park to Seattle takes 4.5 hours. Alternatively, you can take a bus. Prepare for a bit warmer weather when traveling from Olympic National Park in August: high temperatures in Seattle hover around 80°F and lows are around 61°F. Wrap up your sightseeing on the 21st (Wed) to allow time to drive to Leavenworth. Leavenworth is a city in Chelan County, Washington, United States. On the 22nd (Thu), take in the dramatic scenery at Deception Falls, admire all the interesting features of Front Street Park, and then tour the pleasant surroundings at Waterfront Park. Get ready for a full day of sightseeing on the next day: get a new perspective on things with Boat Tours & Water Sports and then take in nature's colorful creations at Ohme Gardens. To find ratings, other places to visit, reviews, and tourist information, refer to the Leavenworth trip site . You can drive from Seattle to Leavenworth in 2.5 hours. Alternatively, you can take a bus; or take a train. Expect a bit warmer weather when traveling from Seattle in August: highs in Leavenworth hover around 86°F, while lows dip to 55°F. Wrap up your sightseeing on the 23rd (Fri) to allow time to travel to Ephrata. Ephrata is a city in Grant County, Washington, United States. On the 24th (Sat), examine the collection at Grant County Historical Museum and then explore the activities along Soap Lake. To find ratings, photos, reviews, and more tourist information, refer to the Ephrata tour itinerary maker website . Traveling by car from Leavenworth to Ephrata takes 1.5 hours. Expect a bit warmer evenings in Ephrata when traveling from Leavenworth in August, with lows around 61°F. Finish your sightseeing early on the 24th (Sat) so you can travel to Spokane. Spokane is a city located in the state of Washington in the northwestern United States. On the 25th (Sun), tour the pleasant surroundings at McEuen Park, explore the activities along Coeur d'Alene Lake, and then pause for some serene contemplation at St. John's Cathedral. Get ready for a full day of sightseeing on the 26th (Mon): tour the pleasant surroundings at Nishinomiya Tsutakawa Japanese Garden and then let the river carry you with a rafting and tubing tour. To find reviews, traveler tips, photos, and more tourist information, refer to the Spokane trip planner . You can drive from Ephrata to Spokane in 2.5 hours. August in Spokane sees daily highs of 86°F and lows of 59°F at night. Cap off your sightseeing on the 26th (Mon) early enough to travel back home.